Chairman Gubbs after his amazing batting performance - the cat that got the cream! 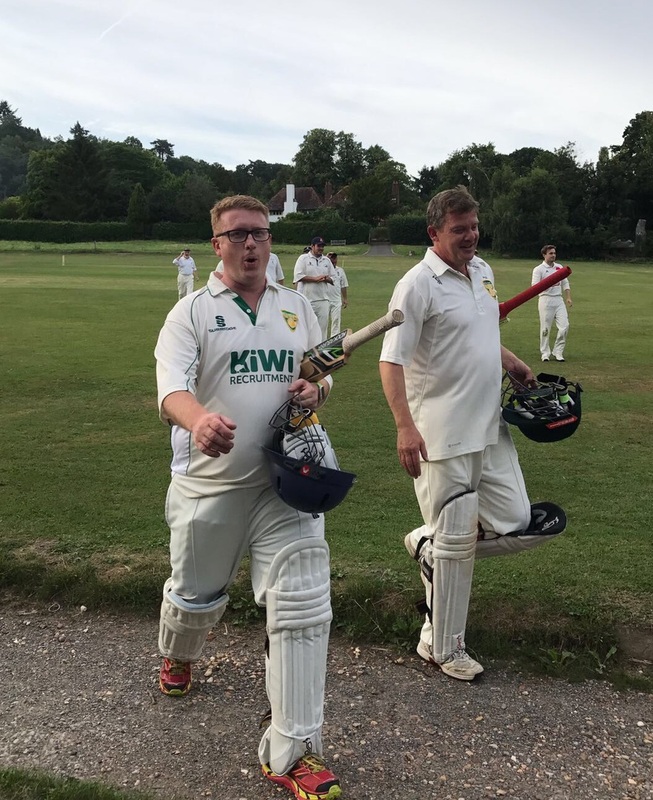 Hawks Chairman Andy Gubbs produced an heroic performance with the bat to record his highest ever runs total (13 not out) but Hambledon proved too strong for Chidham and ultimately ran out comfortable winners. With the Hawks only able to muster 10 players for this evening match across the Surrey border, things were further complicated when Sammi broke down on the way to the match and with O'Donohue and Strudwick running late, Chidham only had 7 batsmen present at the start of the match. 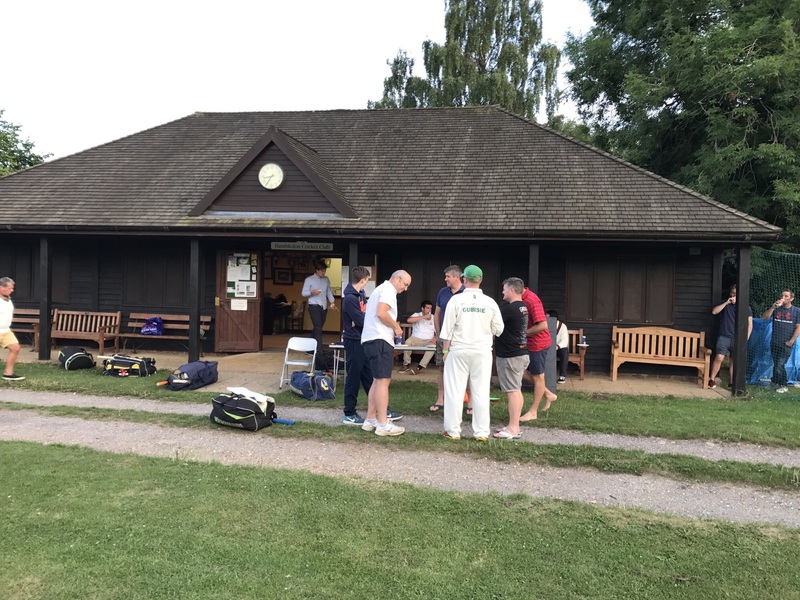 When Andy Gubbs first approached Hambledon for a midweek game he thought he was approaching the famous team from Hampshire - the birth place of cricket - but unfortunately it turned out to be their lesser known counterparts from Surrey resulting in an hours drive for most of the Hawks. 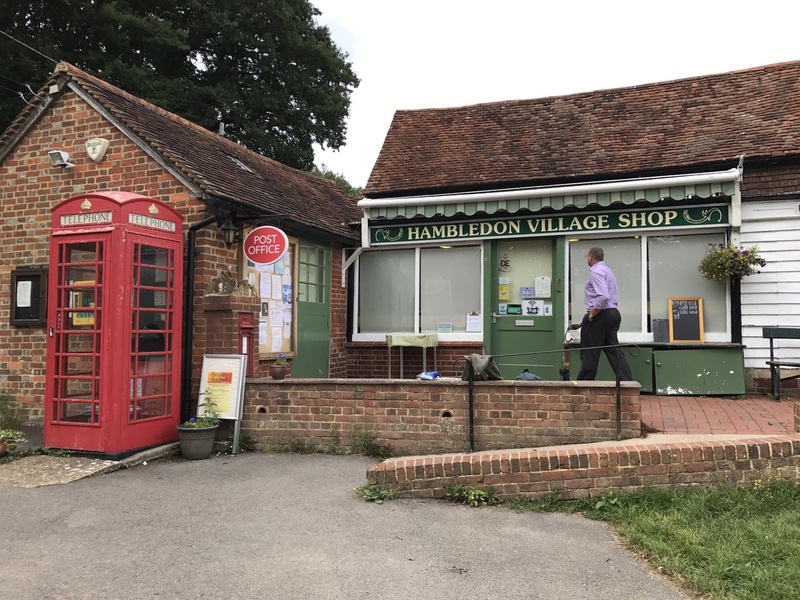 However this Hambledon also has a lovely set up with quaint clubhouse and picture postcard surroundings - the wicket chosen for this evening match was close to the perimeter of the pitch which resulted in a 20 yard boundary on one side making runs easy to come by. Van Niekerk and Smith, celebrating his 45th Birthday at the crease, opened up for the Hawks and when 12 runs were scored off the first over things looked bright. Hambledon then brought on their better bowlers and the run rate slowed up dramatically. Smith was soon gone for just 2 runs after being caught out at mid-on (no Birthday cigar) and Van Niekerk wasn't far behind after being bowled out by a looping bowl from Andy Strudwick - as it turned out a long lost family member of our very own John Strudwick, albeit with more hair! Tommy Phiz got the scoreboard moving for the Hawks and with 5 quick boundaries was soon walking back to the clubhouse after forced retirement. Dungar (7), Wild (8), Davey (6) and Strudders (7) kept the ball rolling for the Hawks before O'Donohue and Gubbs entered into an exceptional partnership which lasted until the end of the innings and saw both players hit double figures. Gubbsie is not renowned for his batting prowess but on this occasion excelled himself - at one point when Gubbsie was facing up a member of the crowd commented, "look at that stance, this is going for a 6" - Gubbs duely despatched the ball through the air and recorded his first ever 6! With only 9 players in the field and the chase set at a lowly 114, things were always going to be tough for the Chidham bowlers, especially with the short boundary. 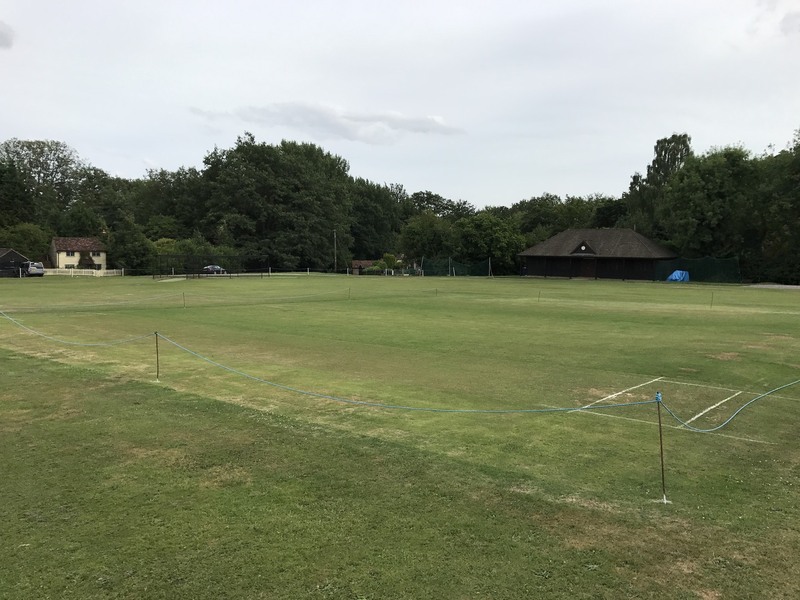 Dungar and Phizackerley felt the brunt of the Hambledon batsmen with only one run-out to show for their efforts and 79 runs against and things didn't get any easier when Strudwick and Smith entered the fray. 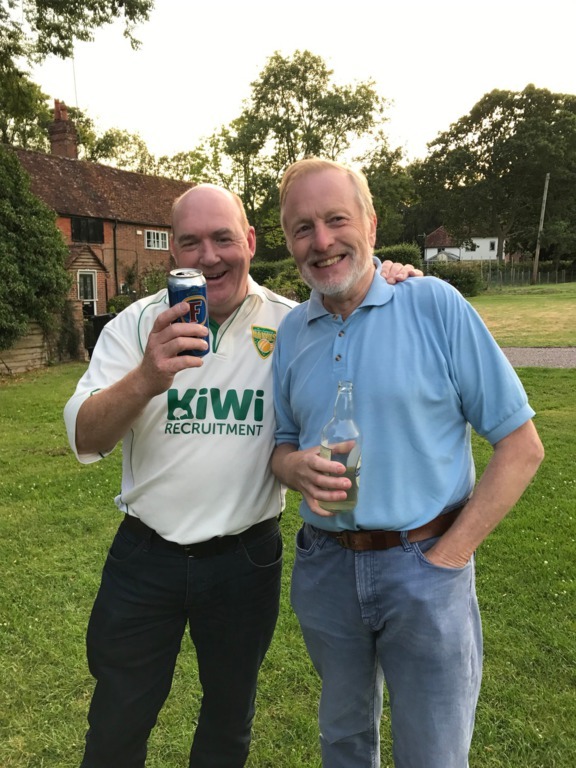 Hambledon clinched the match with 10 wickets and 8 overs remaining before the players enjoyed a delicious BBQ, the smell of which had wafted across the pitch during the 2nd innings, and post-match beers whilst Andy and John Strudwick caught up on all those missed years. The match will long be remembered for the batting performance of Andy Gubbs which more than made up for the heavy defeat.